Clinochrysotile: Mineral information, data and localities. Pale green to white, also yellow to brown, light gray. Named in 1843 by Franz von Kobell from the Greek chrysos - "gold" and tilos - "fiber." Re-named clinochrysotile by Eric James William Whittaker in 1951. 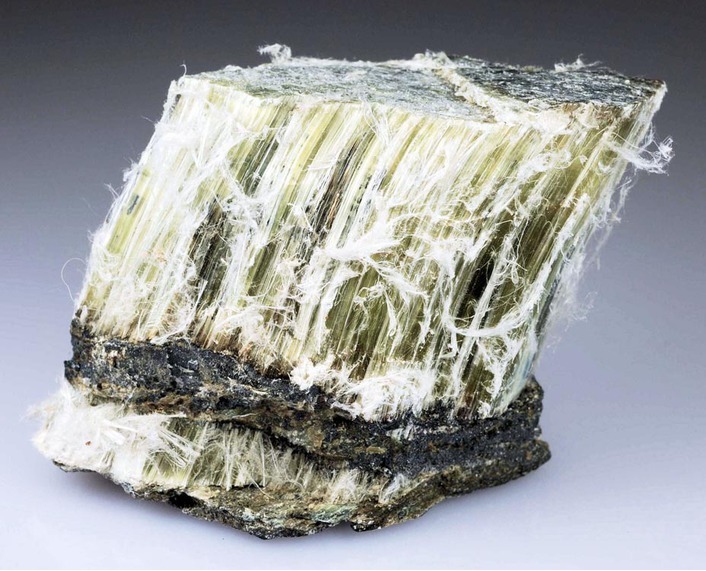 This is by far the most common chrysotile structure and the most common commercial asbestos mineral. Chrysotile was reinstated as the species name of the chrysotile polytypes in 2006. Clinochrysotile represents the monoclinic or triclinic polymorphs of chrysotile. 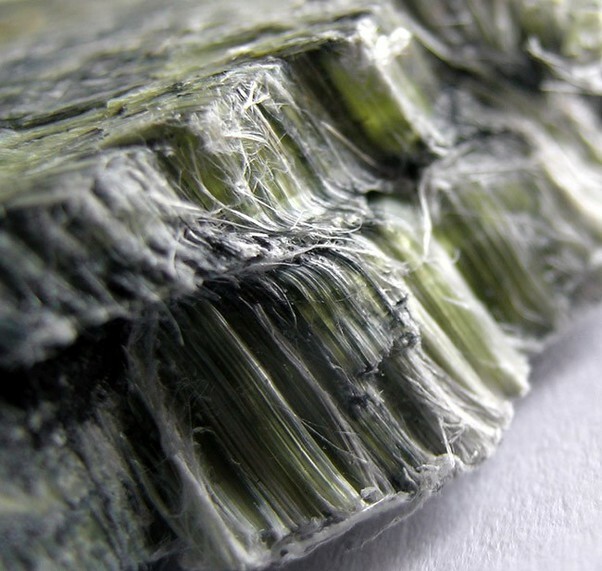 Whereas chrysotile (asbestos) has been known since ancient times from many localities, specimens from the Bell mine, one of the oldest mines in the Thetford Mines area (in operation since 1877), have been the subjects of most of the early structural studies, from which the chrysotile nomenclature was defined. These investigations identified monoclinic (Warren & Bragg 1930), and triclinic (Padurow 1950, Whittaker 1956a) polymorphs from the Bell mine, which should be considered the type locality. Clinochrysotile is no longer a valid species (Burke 2006). Cylinders of chrysotile separate as fine flexible threads or fibers. 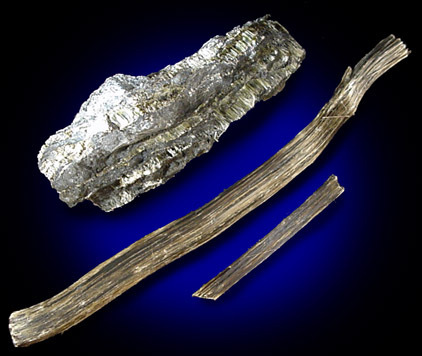 Fibrous, although fine-grained clinochrysotile may be dense and homogeneous in appearance. Settings include Cc and C2/m. Falini et al. (2004) give a = 5.340, b = 9.241, c = 14.689 Å, β = 93.66° (space group Cc). Calcite 4 photos of Clinochrysotile associated with Calcite on mindat.org. Zincite 4 photos of Clinochrysotile associated with Zincite on mindat.org. Franklinite 4 photos of Clinochrysotile associated with Franklinite on mindat.org. Willemite 4 photos of Clinochrysotile associated with Willemite on mindat.org. Demantoid 2 photos of Clinochrysotile associated with Demantoid on mindat.org. Roweite 1 photo of Clinochrysotile associated with Roweite on mindat.org. Magnetite 1 photo of Clinochrysotile associated with Magnetite on mindat.org. Picrolite 1 photo of Clinochrysotile associated with Picrolite on mindat.org. Chrysotile 1 photo of Clinochrysotile associated with Chrysotile on mindat.org. Safe when in large chunks or fragments. Fine particles which can be airborne should be avoided. Low-level frequent dust exposure may cause lung cancer. Warren, B.E. and Bragg, W.L. (1930) The structure of chrysotile, H4Mg3Si2O9. Zeitschrift für Krystallographie: 76: 201-210. Padurow, N.N. (1950) Über die Strukturzelle von Chrysotilasbest. Acta Crystallographica: 3: 204-208. Whittaker, E.J.W. (1956) The structure of chrysotile. II. Clinochrysotile. Acta Crystallographica: 9: 855-862. Whittaker, E.J.W. and Zussman, J. (1956) The characterization of serpentine minerals by X-ray diffraction. Mineralogical Magazine: 31: 107-126. Falini, G., Foresti, E., Gazzano, M., Gualtieri, A. F., Leoni, M., Lesci, I. G., Roveri, N. (2004): Tubular-shaped stoichiometric chrysotile nanocrystals. Chemistry - A European Journal 10, 3043-3049. Stalder, H. A., Wagner, A., Graeser, S. and Stuker, P. (1998): Mineralienlexikon der Schweiz. Wepf (Basel), p. 114-115. Anthony, J.W., et al (1995), Mineralogy of Arizona, 3rd.ed. : 177. Grant, Raymond W., Bideaux, R.A., and Williams, S.A. (2006) Minerals Added to the Arizona List 1995-2005: 4. Page, N.J. and Coleman, R.G. (1967) Serpentine mineral analyses and physical properties. USGS Professional Paper 575-B: 104; Pemberton, H. Earl (1983), Minerals of California; Van Nostrand Reinholt Press: 143, 422. Aristarain, et al: Am. Min. :59:66-70 (1974); Foshag, W.F. : Am. Min. :11:38-39 (1926); Dunn(1995):Pt4:485. Francis, C.A. : The Picking Table:31(2):4-6 (1990); Dunn(1995):Pt4:485. Cairncross, B. (2004) Field Guide To Rocks & Minerals Of Southern Africa: 76.